Forged Alliance Forever • View topic - Standard Black Ops Mod (commander/unit upgrades) not found. Not sure what's going on, but Black Ops, as I remember it from 2015, is no longer here. What gives? 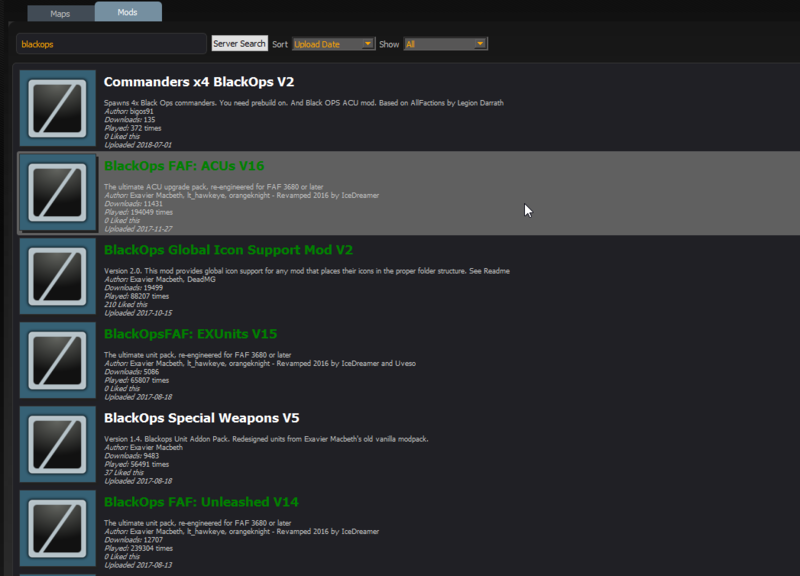 Only thing on the FAF mod vault is Commanders X4 BlackOps V2. Which is NOT what I'm looking for. Anyone know where I can get a functional BlackOps mod rar? As a FAF player I'm confused as to why (reading over years of comments) BlackOps has shown up then disappeared repeatedly. and don't use the black ops icon support mod for the FAF game version! is there still any nonFAF version available i can use for steamFA ? MrTBSC wrote: is there still any nonFAF version available i can use for steamFA ? Are you refering to the original pre-FAF releases or a package someone created for Steam after FAF took over updates to the mods? I still have all the pre-FAF mod packages stored on my server. The old download links i used when GPG was around only went down about a month ago when I switched domain host providers as I haven't had time to set the download section back up at the new location. If its the old packages you want I can get them re-loaded to my server this weekend. I'm afraid I don't posses any of the releases that occured after FAF started managing updates since I was no longer active with the project. would it be possible for you to release/upload the prefaf mod on moddb or would that be too much of a hassle?